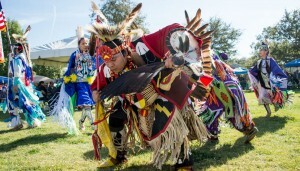 American Indian dancers in a wide array of colorful clothing celebrate native culture at the CSUN 31st annual Powwow in 2014. Photo by Lee Choo. California State University, Northridge will celebrate its 32nd annual Powwow on Saturday, Nov. 28, on the Chicano/a Studies Lawn, located off of Plummer Street and Reseda Avenue in Northridge. Indigenous singers, drummers and dancers will gather for a grand entry scheduled to take place at 12:30 p.m. The grand entry will feature dancers entering an arena in a formal procession. The national anthem and traditional American Indian songs will be performed to honor the flag and veterans. A variety of traditional dances will continue throughout the day, including some that will invite and encourage audience participation. American Indian Studies program director Brian Burkhart said modern-day powwows carry traditions from hundreds of years of indigenous history. CSUN’s Powwow holds true to this dual history, but with a more community-based approach, Burkhart said. The event, sponsored by CSUN’s American Indian Student Association and American Indian Studies Program, is free and open to the public. Parking is available for $6 on the campus located at 18111 Nordhoff St., Northridge.